Blair Men's Catalog outfits today's modern men from head to toe in stylish must have staples with great coupon code savings on the perfect fitting men's sports coat to men's casual suits, footwear and athletic sportswear for men. 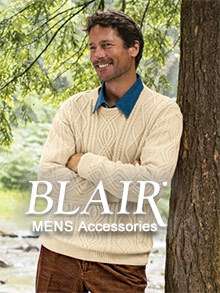 Enter the promotional code - CATALOGS15 - during checkout on the Blair Men's Catalog website. Sportswear for men - Men love long lasting comfort. Blair Men's catalog helps you sport casual activewear and sportswear for men that will make you feel comfortable while looking your coolest out on the basketball courts. Stock up on hooded or crewneck sweatshirts, vintage graphic tees, baseball jackets, jogging suits, DURAFleece shorts, cargo pants, swim shorts and more casual styles for men to lounge, work out or play in! Men's casual suits - After filling your gym bag with Blair's everyday sportswear for men, shop for men's casual suits that will save you on days when you need to take your wardrobe up a notch. Perfect for work, business meetings, special occasions or a casual date, you'll find casual suiting styles that look smart while maintaining a casually elegant vibe with suiting separates in classic neutral colors that you can mix and match for a variety of easy, put together and effortless looks! Men's sports coats - The easiest way to upgrade an outfit? Slip on a smart men's sports coat from Blair. Dress up a pair of jeans or dress down a traditional shirt and tie combo with a selection of classic linen men's sport coats, wool sports coats, lambskin leather blazers or western, herringbone silk and micro suede sports coats that are sleek, modern, and a must-have piece for any sharp-dressed man's closet! Men's accessories - It's all about the little details, so invest in contemporary accessories that will add the finishing touches to all of your menswear ensembles. Go casual with ball caps, driving caps and bucket hats that work with Blair's collection of sportswear for men, add a leather belt or suspenders to a pair of sharp-creased trousers, or style those men's casual suits by showing off an elegant watch, handkerchief or a personalized pair of sterling silver cufflinks. Offering exceptional clothing styles for men who want to look their best, Blair Men's Catalog makes shopping for suiting, casual clothing and sportswear for men a pleasure with affordable prices and an outstanding selection.